But then I realised that none of my pictures was in the style that other bloggers posted because I don't look like all the fashion bloggers on your Instagram feed. Why? Because I'm not a size 6. Because I don't have perfectly blow-dried hair and an assortment of Cartier love bracelets adorning my wrists and I certainly don't have a wardrobe of designer bags to match an outfit. It should be no surprise when I say that the blogging community lacks diversity - particularly when we come to award season. And it lacks diversity in all sense of the word - it's mainly white, blonde and slim bloggers who make it - and this is said without bitterness, as it's reflective of the world we live in. As much as the fashion industry pushes for diversity, there are still issues. But as bloggers, and as part of a community without any rules, we have the chance to change this. However, as it stands, the blogging community is divided by "size 8" and "plus-sized" style bloggers. There is hardly a middle ground. Thankfully there are several bloggers trying to establish this mid-point, but there's still so much work to be done. But this is more than me than simply 'fit in', it's reflective of years and years of being physically bigger - and I mean this in all sense of the word. I've talked countless times about how I grew up in Asia, and since the age of four, I was always the biggest in the class. This didn't mean I was a fat child (but I had my moments), but I was always taller, and because I swam from a young age, I was never skinny. And I'm almost certain that this has lead to an insecurity that has always been there, despite now living in the UK and wearing a size that is technically smaller than the national average. I've blogged about my fitness journey on here and to be honest, despite going to the gym fairly regularly for the past year or so, it's still been a learning curve. I've put on weight, I've lost weight, and I've yo-yo'ed. And a lot of it comes down to the fact that I regularly post pictures of myself online. 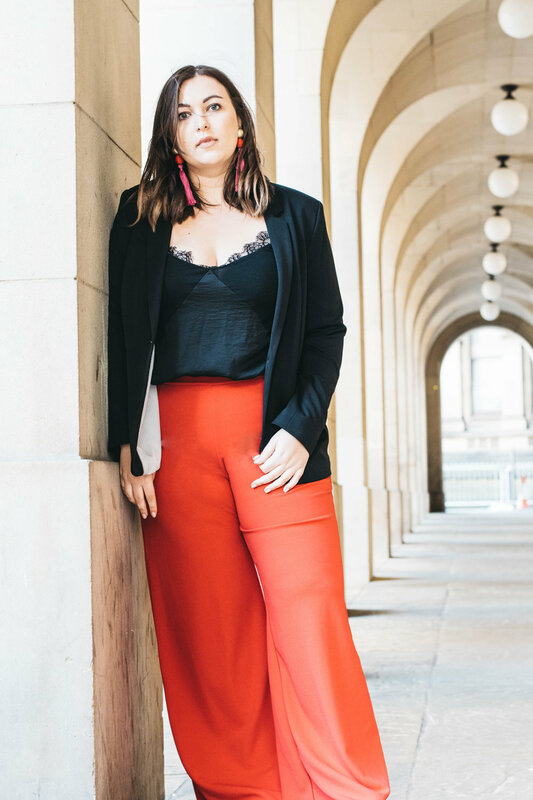 But regardless of the fact that I've never once had a negative comment on this blog about how I look, it's still an insecurity - an insecurity to the point where I did photoshop these pictures because of how the fabric of the trousers folded. And I suppose this insecurity may be the reason that I'm so aware of this divide within fashion blogging. But hey. It's there. Although, I'm not saying that this is my endpoint. I know I'll never be a size 8, or probably ever a size 10, but I'm really over this division within the fashion blogging community. It's a divide that is also reflected in how brands treat their social media - because let's be honest, no matter how banging a photo is, most brands will never regram it unless you look like a model. So perhaps this is all just reflective of deep-rooted issues within the fashion industry, or perhaps there's no market for 'average' girls? Who knows, but until that point, we need to continue to encourage the growth of 'average' style & fashion bloggers and get rid of the perception that there isn't the market for it. Because there is. And it's pretty fab.